Netflix and chill … and add it to Instagram Stories while you chill. 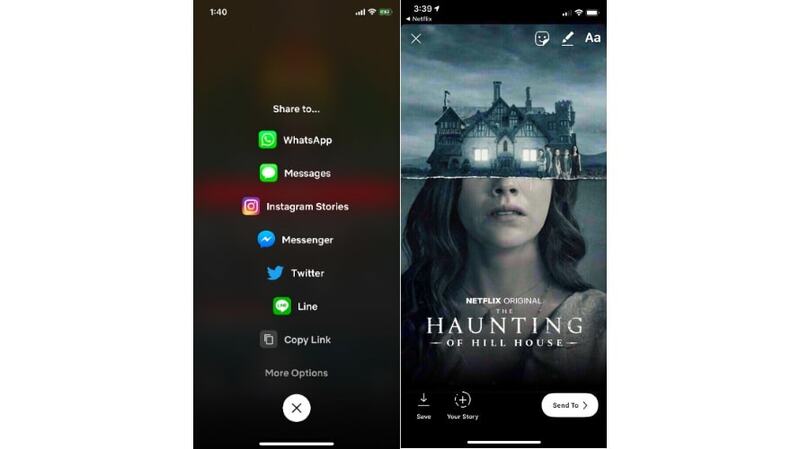 People using Netflix’s iPhone application now have the option of sharing what they’re watching directly to Instagram Stories without leaving the Netflix app. The feature is available to iPhone users starting Tuesday, and it will be added to Netflix’s Android app somewhere down the line. When the feature is used, Netflix’s default art for the title being shared will appear in the Instagram Story, but users can customize it with options from the photo- and video-sharing network including stickers and comments. Clicking on the Netflix content shared to Instagram Stories will enable people on Instagram who also have the Netflix app installed to go directly to the movie’s or show’s page in the Netflix app.